In case you missed it, to kick off the New Year we redesigned our search interface and made it more powerful and useful in a range of ways. You don’t even have to sign up to take advantage of our advanced search and discovery functions with metrics about your favorite journals and publishers. One of our favourite upgrades is how each of more than 24,000 journals are featured and displayed. Now it is possible for anyone to see what journals exist on our platform and how many articles are tracked for each one of them. That’s the first step. Try searching for your favourite journal, or even a journal you work for, and seeing what we have for it. 24,000 journals, arranged by how much content we have indexed from each on our platform. At ScienceOpen, we are constantly upgrading and adapting our platform to meet the needs of the different stakeholders in scholarly publishing. We work with a huge range of publishers (e.g., Brill, Open Library of Humanities, Higher Education Press PeerJ, Cold Spring Harbor) and listen to the needs of researchers, together building solutions to help enhance the global research process. With the re-launch of ScienceOpen, we really are pushing forward to create a multi-purpose, solution-oriented platform that aligns with ongoing trends in scholarly publishing. Our new platform provides an invaluable service for publishers and editors. We provide aggregate metrics for re-use, including the number of readers on our platform and the summed Altmetric score. As you can see in the example below for BioMed Central, these numbers can be used to look at how well you’re competing with other publishers, as well as how your content is being read and re-used by researchers. 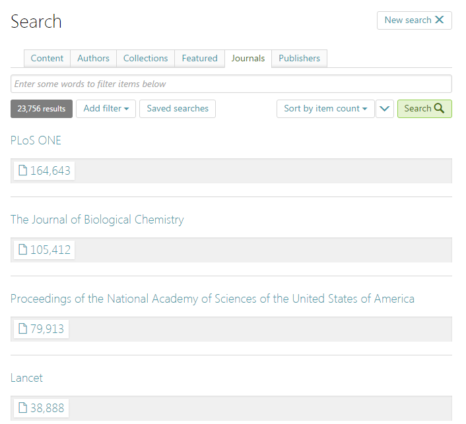 Content on the site is aggregated through PubMed Central, SciELO, ORCID and arXiv or added via reference analysis with a DOI metadata check with Crossref. Or publishers can work directly with us to add their content to the site for a fee. We now offer extra features like a “read” button link back to the publisher version of record. We are happy to index content of all license types. The more of your content we have on our platform, the better the level of service we can provide for you. As part of our ongoing development of ScienceOpen 2.017, we have designed an exciting and most importantly, pretty, new context-enhanced webpage for each of our 27 million article records. Such enriched article metadata is becoming increasingly important in defining the context of research in the evolution of scholarly communication, in which we are moving away from journal- to article-level evaluation. All of the statistics have been moved to the top of the page, including the number of page views or readers, the Altmetric score, the number of recommendations, and the number of social media shares. Newly featured statistics include the top references cited within, the top articles citing that paper, and the number of similar articles based on keywords and topics. These new features are great for authors as content creators, researchers as users, as well as publishers for understanding the popularity and context of research they publish. With the launch of our new unified search interface, we restructured the Author Profile page on ScienceOpen, providing dynamic ways to explore an author’s output. For a very prolific author like Ray Dolan, Director of the Wellcome Trust Centre for Neuroimaging at UCL and author of 674 articles, it can be hard work for a reader to even just scroll through the titles of his total output. 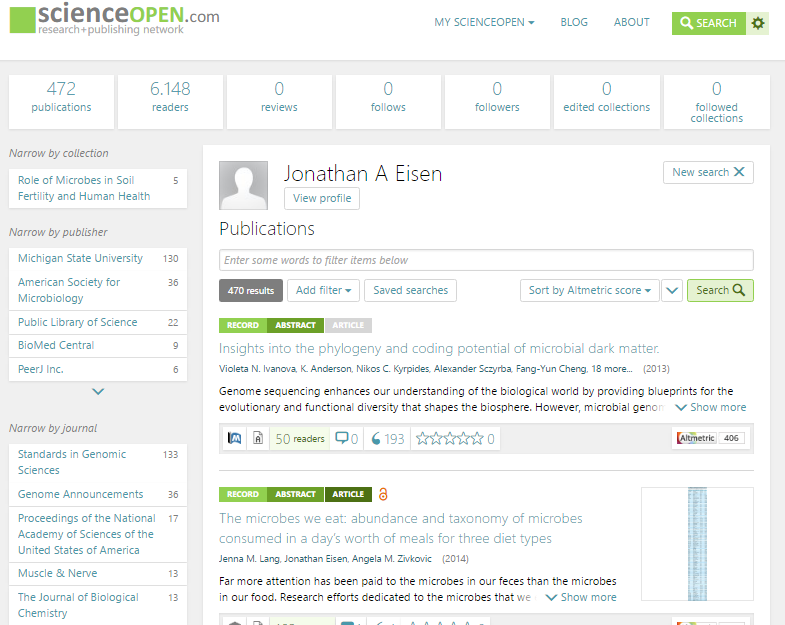 The new ScienceOpen author profile, however, provides the researcher a variety of avenues to delve into this content on their own terms. 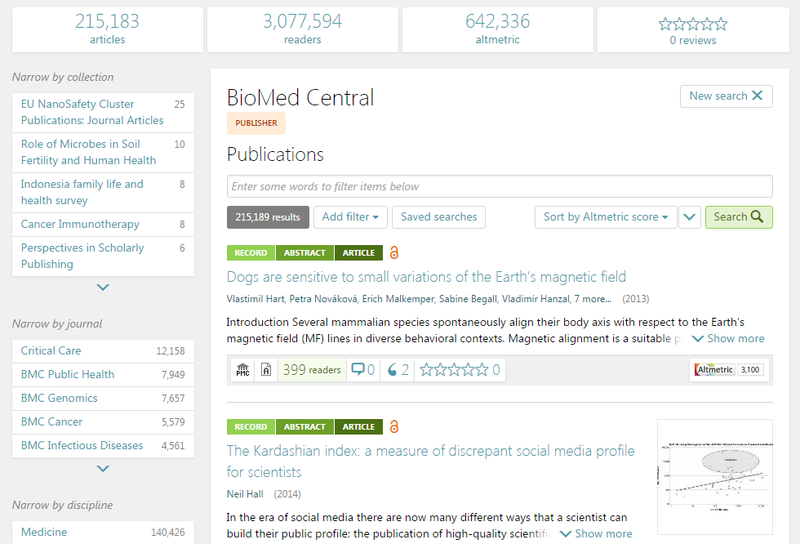 They can sort publications by Altmetric score, citations, usage, date or reviews – to find the view that fits their needs. The top metrics bar provides a view on total usage of the articles on the site and activity by the author. And if you want to know more about the background of the author just click on the profile button for biography and more. 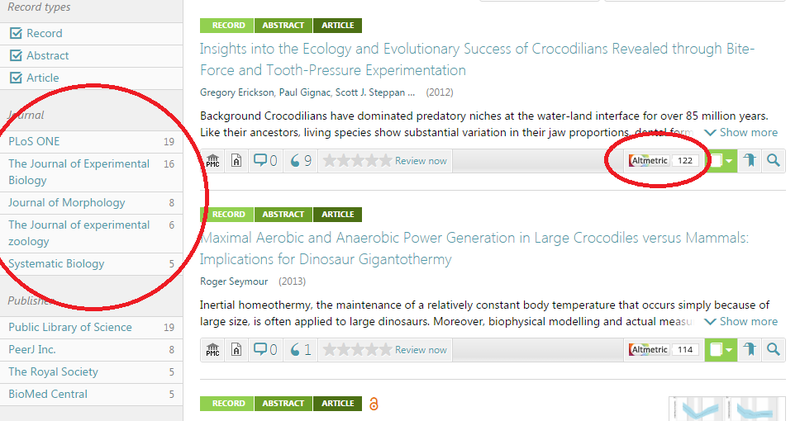 Below are several examples of interesting profiles on ScienceOpen to inspire you. We welcome you to search, explore, link your ORCID to your own profile and share your experience with us. 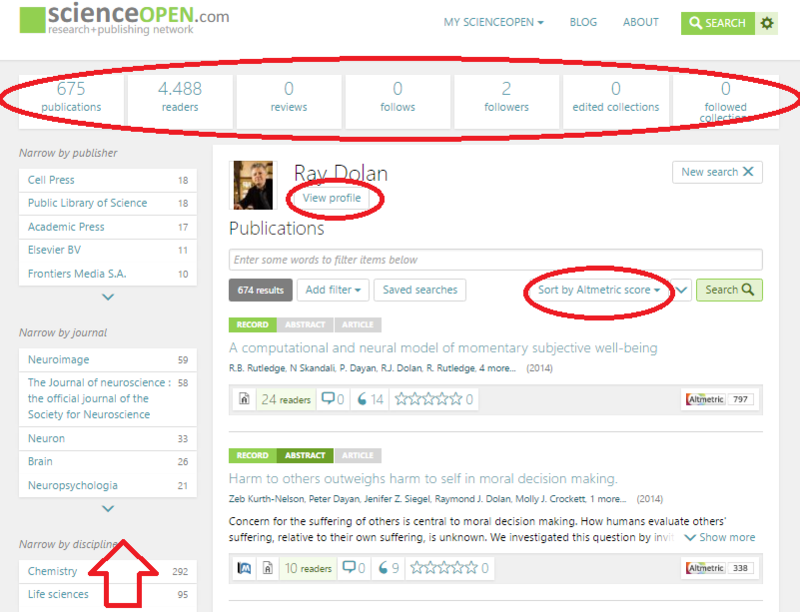 At ScienceOpen we are striving to serve the academic community and always welcome your input. 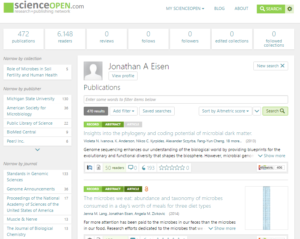 ScienceOpen is more than just a publisher – we’re an open science platform! We publish from across the whole spectrum of research: Science, Technology, Engineering, Humanities, Mathematics, Social Sciences. 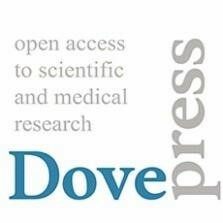 Every piece of research deserves an equal chance to be published, irrespective of its field. We also don’t discriminate based on the type of research. Original research, small-scale studies, opinion pieces, “negative” or null findings, review articles, data and software articles, case reports, and replication studies. We publish it all. At ScienceOpen, we believe that the Journal Impact Factor (JIF) is a particularly poor way of measuring the impact of scholarly publishing. Furthermore, we think that it is a highly misleading metric for research assessment despite its widespread [mis-]use for this, and we strongly encourage researchers to adhere to the principles of DORA and the Leiden Manifesto. 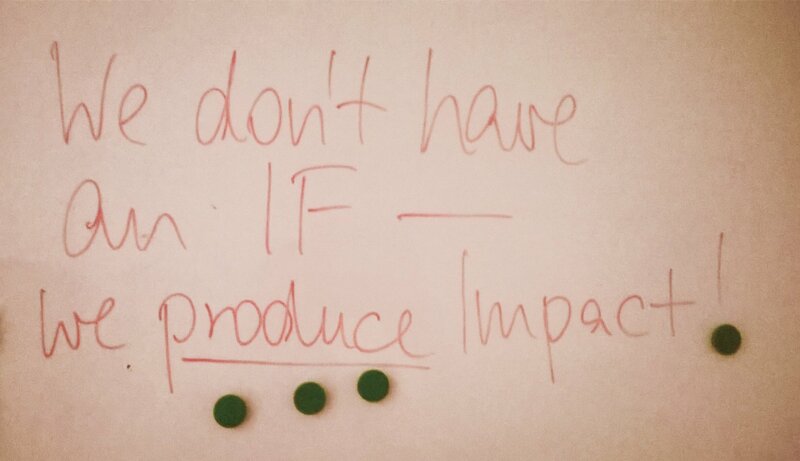 This is why for our primary publication, ScienceOpen Research, we do not obtain or report the JIF. We provide article-level metrics and a range of other article aspects that provide and enhance the context of each article, and extend this to all 25 million research articles on our platform. For years now, the journal and the publisher have held sway over many aspects of discovery and evaluation of research and researchers. The development of the Web was expected to disrupt this, but innovation has been slow. Collectively, the research community have been cautious in embracing the power that has been granted to us for integration, sharing, and using semantic technologies to enhance how we read, communicate, and re-use the scientific record. At ScienceOpen, we believe that opening up article-level information will be part of the next wave of innovation in scholarly publishing and communications. Our CEO, Stephanie Dawson, spoke about this with Research Information recently, conveying the idea that we need to embrace the power of modern technologies to unlock the multi-dimensional intrinsic value of articles in their broader ‘context’. 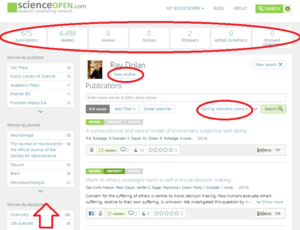 At ScienceOpen, we’re constantly upgrading our platform to provide the best possible user interaction experience. We get feedback from the research community all the time, and try to adapt to best meet their needs. So today, we’re happy to announce two neat little features in our latest updates. 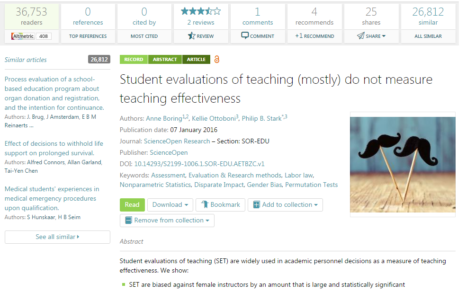 Firstly, all Open Access articles now have a cute little symbol next to them, making it even easier for you to discover open content. This shows up on all of our Open Access content across nearly 14 million article records now. Making open content stand out is a great way to encourage others to adopt open practices, as well as help people see which content they can re-use most easily. As well as this, we have a new browsing function built into our collections. Sometimes, collections are pretty big. Our new SciELO collections have some with tens of thousands of open access articles, and sifting through that manually is not exactly a valuable use of ones time. 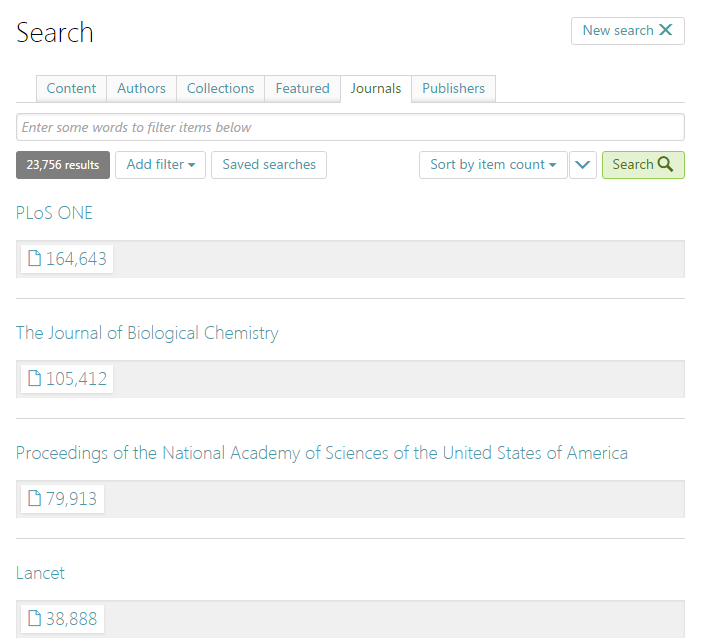 With this new function, you can now filter content within collections by journal, publisher, keywords, and even filter them by citations or Altmetric scores. Discovering content relevant to your research should be smart and efficient, and this is what our platform delivers. Try it out on this collection, or build your own!